An epic journey through Germany and Austria - explore the imposing spires of Cologne and Salzburg, travel the Fairy Tale road to follow the footsteps of the Grimm Brothers, and tuck into Vienna's Kaffee und Kuchen culture. Tue., May 21 - Arrive Vienna: Hotel Mercure Grand Biedermeier accommodations include daily breakfasts. Wed., May 22- Vienna: Morning half day sightseeing tour discovering downtown Vienna including the Ringstrasse, St. Stephen’s Cathedral and the Opera House. Enjoy a walk around the Hofburg Palace, the former winter residence of the Imperial Family. See the neoclassical Parliament, the acclaimed Burgtheater and the striking City hall and stop at one of the traditional Viennese Cafes to experience a Viennese coffee brewed at its finest with a delicious cake. The afternoon is free to explore on your own. This evening enjoy a typical Heuriger dinner in the Grinzing wine growing region of Vienna as a tour service. Thu., May 23- Vienna: This morning we continue our tour of Vienna with a visit to the historic state-rooms of the Schonbrunn Palace, the former imperial summer residence. Take a stroll through the palace gardens before we continue on to the Belvedere Palace, home to Prince Eugene of Savoy and stroll around the beautifully landscaped garden. Afternoon free for personal enjoyment. Fri., May 24- Vienna/Salzburg: Today, we have a full day of beautiful old villages, steep vineyards and medieval castles. In the castle of Dürnstein, King Richard the Lionheart once was imprisoned. Along the way enjoy a scenic boat cruise on the Danube River passing by lovely countryside villages. 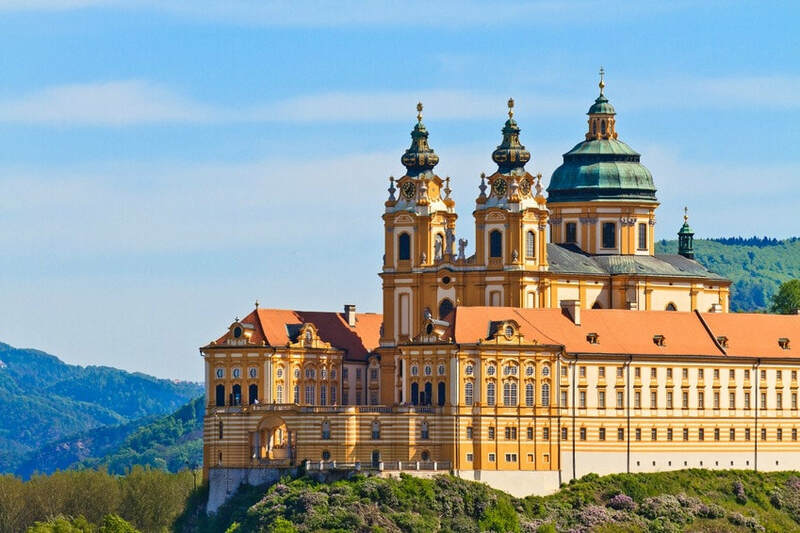 Upon arrival in Melk enjoy lunch as a tour service, before we visit the magnificent Benedictine Abbey of Melk and continue on to Salzburg. Hotel Wyndham Grand Salzburg Conference Center accommodations include daily breakfasts. Sat., May 25- Salzburg: This morning we start with a walking tour of the downtown of Salzburg one of the best-preserved city centers north of the Alps. Pass by the Old City Hall and bell tower, and see the façade of the Mozart’s home. Stroll along Getreidegasse, Salzburg’s famous shopping street and see St Peter’s Abbey and Cemetery dating back to about 700 when it was founded. Visit the Hohensalzburg Fortress on the other side of the River overlooking the city and finally the Salzburg Cathedral on Domplatz. Your visit will continue with a short bus ride to Hellbrunn Palace and visit the Palace interior with the gardens and the famous trick fountains. The afternoon is free to explore on your own. Sun., May 26- Salzburg/Neuschwannstein/Munich: Full day of travel from Salzburg to Munich with a visit to the famous Neuschwannstein Castle. 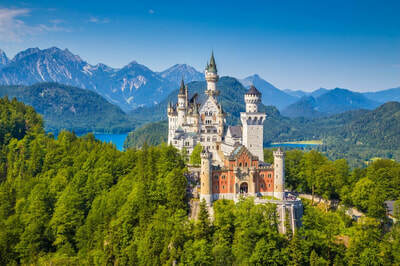 Enjoy lunch at a local restaurant along the way before arriving to the famous fairytale castle in the village of Hochenschwangau built by King Ludwig in the 19th Century in a time when castles no longer had strategic and defensive purposes. Hotel Hilton Munich City accommodations include daily breakfasts. Mon., May 27- Munich: Morning city sightseeing highlighted by Marienplatz , the central square in the heart of Munich and home to the Neues Rathaus (New Town Hall ). The tower houses the Glockenspiel, a beautiful chiming clock that is over 100 years old. At noon the Glockenspiel rings and you can watch the 32 life-sized figures reenact historical Bavarian events. Afternoon is free to explore on your own. Dinner is included at on of the city's famous brewery restaurants, as a tour service. Tue., May 28- Munich/Rothenburg: Morning drive to Rothenburg. Hotel Altes Brauhaus accommodations include daily breakfasts. Afternoon walking tour to explore Germany's best-preserved walled town. Dinner is included as a tour service. After dinner, enjoy a medieval wonderment Night Watchman tour. Follow him through dark alleyways and across dimly lit squares and enjoy the special mood of the town at night. Listen to his stories and find out how the people lived in the Middle Ages. Wed., May 29- Rothenburg/Wurzburg/Bamberg/Nuremberg/Rothenburg: Full day tour to explore three Bavarian towns. Enjoy a walking tour of Wurzburg with the Marktplatz and the Wurzburg Residenz, one of the most beautiful baroque palaces in Germany. Next visit Bamberg visiting the lively heart of Little Venice, the market gardener’s district steeped in tradition and the New Residenz of Bamberg. Lunch is included at a local brewery pub restaurant as a tour service before we continue on to Nuremberg for a walk through the romantic old town to see Albrecht Dürer's House, the Nuremberg Castle and beautiful fountain. Return to Rothenburg for the night. 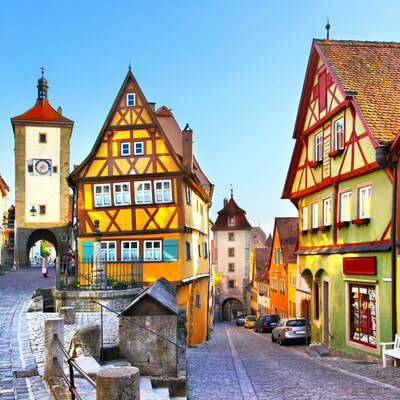 Thu., May 30- Rothenburg/Kassel: Today we embark on a 2-day fairytale journey in the footsteps of the Brothers Grimm. Explore the countryside that inspired a thousand legends and where the Brothers Grimm did much of their fairy-tale research in the 1830s. Visit Gottingen and the Ganseliesel Figure (Little Goose Girl), the landmark of the university town, as well as the historical center with medieval churches, half-timbered house and venerable old buildings. Lunch is included as a tour service before we continue on to Kassel. The Brothers Grimm lived and worked in Kassel for over 30 years. Hotel Schlosshotel Wilhelmshoehe accommodations include daily breakfasts. The balance of the afternoon is free to explore the Wilhelmshohe Park around the hotel with the Colossal Palace built 1700-1717 capped with a huge Hercules Monument and tiered ponds. Buffett dinner is included at your hotel. Fri., May 31- Kassel/Bremen: Enjoy photo stops at the Sababurg and Trendelburg Castle complexes viewing Rapunzel’s Tower. Enjoy a walk in Hamelin’s beautifully restored historical town. The old quarter centers around Osterstrasse and Pferdemarkt square with narrow, winding lanes and the unique pavement painted with thousands of little rats that are associated with the legend of the Pied Piper. Lunch is included as a tour service. On arrival enjoy a short sightseeing tour of Bremen. Hotel Swissotel Bremen accommodations include breakfast. Sat., Jun 1 - Bremen/Hamburg: Drive to Hamburg to attend the Rotary Convention.